Could Your Migraine or Headache be TMJ? The Link between TMJ and Headaches. Your face feels tighter than ever, your jaw is locking, and your head is absolutely pounding. The tension you feel between your eyes is clouding your judgment, is causing you pain, and worst of all, is totally ruining your day. You’ve never felt a pain like this in your jaw before…or have you? You then remember two things: 1) that the last time you had a headache this bad, you also experienced jaw pain; and, 2) that, unfortunately, those episodes with simultaneous head and jaw pain are happening much more frequently. This aching feeling could potentially be a TMJ headache. The good news is these headaches can be remedied, and we know how to help you do just that. Let’s dive into the subject a little bit deeper so you can better understand both TMJ and the symptoms of TMJ-related headaches. For starters, TMJ is just the acronym for your temporomandibular joint, which is the hinge that connects your jaw to your skull. When someone suffers from temporomandibular disorders (known as TMD), that means they are having difficulties with their temporomandibular joint. This hinging joint is both super functional and quite complex, leaving the door open for several issues that could affect your overall TMJ health, including difficulties talking, laughing, and chewing and… even severe headaches. 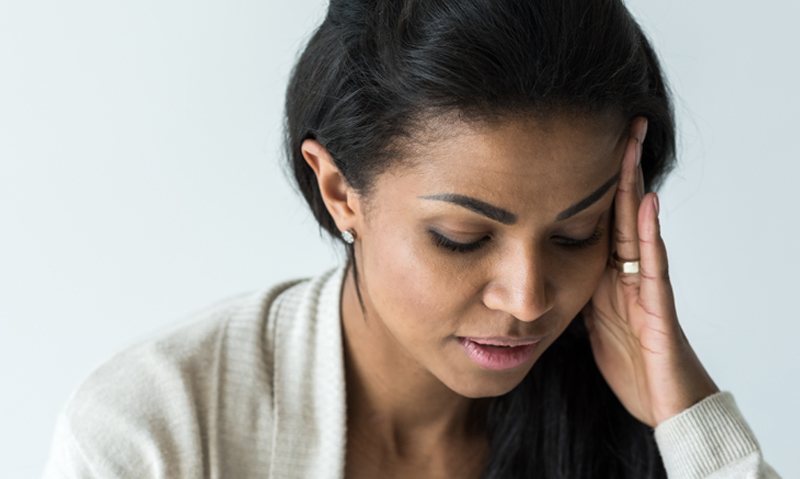 TMJ-related headaches are actually a very common occurrence. According to the American Migraine Foundation, about one in every ten people in the United States has reported TMJ pain. Why Does This Affect My Head? It might seem a bit confusing that the TMJ hinge is the cause of your pain—especially since that hinge is located in your jaw! But, let’s think about that for a minute. The TMJ actually runs along your jaws and your cheeks, and when these muscles tense-up, that pain can also be felt in other nearby muscles and joints, causing your head to tighten-up and ache as well. It’s hard to distinguish between a regular headache and a TMJ headache, but if most of your headaches typically include jaw and facial pain, horrible tightness in your jaw that restricts you from opening your mouth, or even popping noises from your jaw, then it’s likely you’re suffering from TMJ headaches. These headaches will feel like tension headaches and can affect several different regions of your face, including the areas behind your eyes, your lower skull and neck areas, and even the sides of your head. Unfortunately, TMJ headaches are often quite difficult to identify and are frequently misdiagnosed. We’ve been describing some pretty gloomy symptoms, but there’s hope. Dr. Gary Alhadef at Dallas Cosmetic Dental is well-versed in the concerns associated with TMJ and TMJ headaches. Because TMJ problems can be caused by tooth and jaw alignment issues, Dr. Gary Alhadef can provide several different treatment options, such as realignment, surgery, or custom appliances to soothe your headaches and to entirely correct your TMJ issues rather than just treating the pain. With our dental expertise, we can help you forget about your TMJ-related headaches, ending your pain and making it possible for you to live a healthier, happier life.